Walleye Warehouse is a multiplayer stage in Splatoon and Splatoon 2. Walleye Warehouse is a close-quarters stage, featuring a plethora of obstacles such as crates, boxes, and conveyor belts. The spawn area is a narrow hallway with a single slope leading down, In front of the spawn is a moderately open area with multiple paths leading away, and a large crate for last ditch defenses. The only way on to this level is through a large tarp ramp, forcing players to walk up in their vulnerable humanoid forms. The spawn point area is accessable to the enemy team. The right path from spawn and right opening of the middle floor form a long route to the side areas of the center arena. The left path winds around the outer side of the map in to the opposite side area, with grates extending out from occasional openings in the walls. Going from the middle floor to the main floor is a simple drop, but the most direct opposite path is using another tarp-covered ramp. Beside the ramp is a crate that can only be jumped on to from the top floor, and is a great long-range harassment perch. The center is a large square with a U-shaped stack of boxes in the middle, fully-inkable. On either side are the side areas, similar to the main area in shape and size, with some boxes of their own at their center, as well as a large wall for cover. There is an abyss on each base area the player can fall to by sliding and jumping through the fences. Walleye Warehouse in different terrain. The Splat Zone in this map is located in the central battlefield, with half on one side, half on the other. The stacked crates are at the center of the zone. In order to gain control of the zone, a team will have to take control of both sides and defend the opposing side from enemy ink in order to keep the zone. The tower is located in the middle of the map, up high the platform. The tower will just go straight forward and go to the finish which is in front of the rival spawn point. The first checkpoint is located immediately next to the lower uninkable ramp. The second checkpoint is located in the center of the middle elevated area. The Rainmaker in Walleye Warehouse starts in the center of the U shaped crates. The goal is located directly right from the bottom of the ramp at the opposing team's base. The blocks from the Splat Zones and Tower Control maps for Walleye Warehouse are still in their same spots, as well as some new blocks added for cover from the Rainmaker's ink tornadoes, and for the person holding the Rainmaker to quickly get up the ink resistant ramps. The basket and the bump near it are located in the lower surface near the un-inkable ramps. There are three passage ways for the basket. Through the center or through the left narrow path or right side by climbing the block. Walleye Warehouse underwent a series of changes between its development period and release. The crates near teams' bases were fully inkable. The ramps used to access different levels of teams' bases were fully inkable. There were large crates hanging from moving hooks in the Central Battlefield. The current stack of boxes in the Central Battlefield was not present. The Side Passages were not present. Stairs were used to access teams' Spawn Points. The large, moving crates hanging from hooks. A staircase leading to a team's base. Walleye Warehouse was released with launch of Splatoon. Adjustments have been made to prevent users from taking certain shortcuts in Rainmaker mode. Adjustments have been made to object placement in Rainmaker Mode. An Inkling with a Splattershot shooting at another Inkling. A battle atop the various platforms. Two Inklings charging into battle to take on the enemy. An Inkling coming out of super jump at the head of the battle field. The opening scene for Walleye Warehouse. An angled overhead of one of the bases on either side. An Inkling at Walleye Warehouse during Splatfest. An Inkling exploring Walleye Warehouse during Splatfest. An Inkling in Walleye Warehouse at night. An Inkling looking through Walleye Warehouse during the Cat/Dog Splatfest. An Inkling in the middle of a Super Jump. Jellyfish dancing behind one of Walleye Warehouse's Spawn Points during a Splatfest. Promo for Splat Zones at Walleye Warehouse. Results of a Turf War in Walleye Warehouse. Walleye Warehouse was released in 15 December 2017. 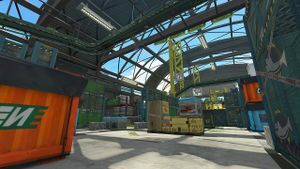 Aside from the addition of a few small boxes in the center of the stage, Walleye Warehouse remains unchanged when compared to its Splatoon counterpart. Winner design of a grafiti in Squid Fashion contest of Famitsu magazine was added to Walleye Warehouse. 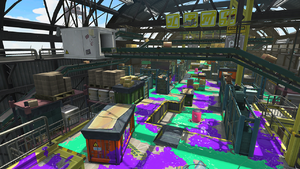 Walleye Warehouse was one of the two playable stages during the Splatoon Global Testfire, alongside Saltspray Rig. Callie and Marie once held a part-time job here prior to hosting Inkopolis News. The map's name is a reference to the real-life walleye. The fish shares some similarities with the map itself, with its dark olive or brown color and somewhat rectangular shape, similar to the many containers in the warehouse. 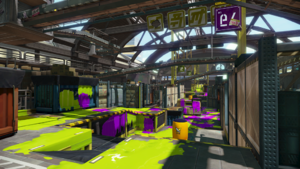 Walleye Warehouse and Arowana Mall are the only stages available from the game's initial release not to be featured in Octo Valley missions. A chiming sound can be heard just before the match ends. The internal codename for this stage in the game files is "Warehouse". It is the smallest stage in Splatoon 2. Walleye Warehouse is derived from the nouns Walleye and Warehouse, Walleye is a fish that their eyes point outward, as if looking at the walls hence the name Walleye. Warehouse, is a commercial building for storage of goods. Warehouses are used by manufacturers, importers, exporters, wholesalers, transport businesses, customs, etc. They contain containers, crates, boxes, and conveyor belts. ハコフグ倉庫 hakofugu sōko is derived from Boxfish and Warehouse, Boxfish is a squared, bony fish and Warehouse is a large plain building with containers, crates, boxes, and conveyor belts. French Encrepôt A portmanteau of "encre" (ink) and "entrepôt" (warehouse). This page has been accessed 40,460 times.